The flat product steel industry today continues to look to improved performance across a wide range of thermal systems. Fives is well positioned to address the needs with an emphasis on improving production and reducing emissions. The steel industry today is focused on improving performance across a wide range of thermal systems for upgrading the combustion systems of steel process furnaces such as continuous annealing lines, galvanizing lines, annealing and pickling lines, strip preheating, strip drying, edge heating, Strip cooling, batch annealing, indirect fired applications, direct fired applications, upgrading reheat and preheating furnaces, soaking pits and plate and slab heat treatment furnaces. The investments today are directed toward improved production, optimum efficiency, and low NOx and CO emissions. Fives offers a wide range of superior combustion solutions to address these drivers. 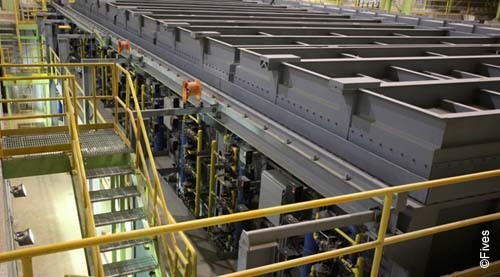 Fives, with North American solutions, offers a range of high technologies spanning regenerative radiant tube combustion, plug-in recuperative low NOx radiant tube combustion, non-oxidizing direct fired burner systems, regenerative direct-fired systems, permitting optimal production, NOx emission and lower fuel consumption. Fives provides its expertise and services to supply tailor-made solutions and ensure an optimal performance and improved availability of combustion equipment.